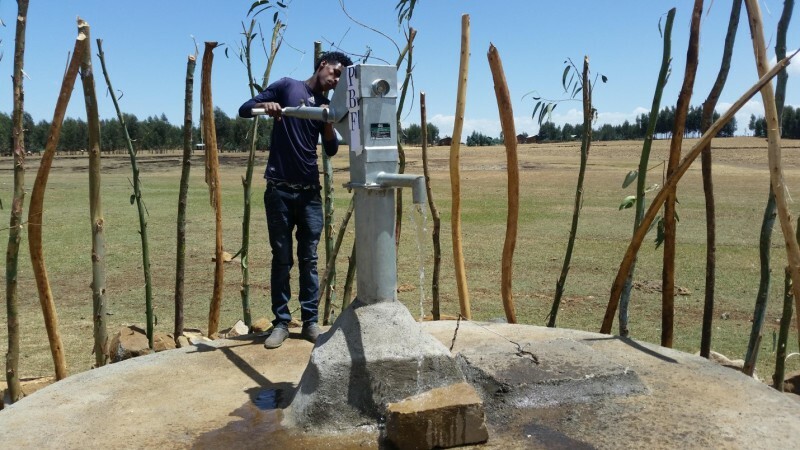 Gashena is a small town located in one of the most naturally draught and famine prone zones of the Amhara region with very minimal and inconsistent rainfall. It is also one of the most forgotten areas which is not benefiting from the socio-economic developmental programs of the government. Considering this backlash, PBF has been providing health service to the community as of the official inauguration of the Gashena Medium Clinic, which was built and being operational under the financial and material support of PBF. Considering the fact that the main diseases affecting and accelerating the death of children, women, elderly and the poorest are water-borne diseases(both bacterial and virus) as well as transmitted diseases, extraction of clean water from the ground, is found to be the most effective strategy of minimising such mega-health problems in the area. we had a strong determination that providing clean water and sanitation has to be one of Emmanuel clinic’s aims to make measureable and sustainable improvement in water supply in the area and serve the community as an integral part of its health mission. With this strong belief, it has been 3 months since PBF endorsed the financial budget for the underground water excavation and distribution project based on the formal proposal submitted by the Head of the Clinic, Mr Ashenafi Mamo. Now, the project is successfully completed and it has been officially inaugurated by the special representative of PBF’s Vice President, Mr. Vic Eugster. This project is one of our successfully implemented humanitarian works in the area. Currently, this water pipeline is producing 15,000 litters per a day and a total of 50 families _ with an average of 5 people in a household are directly generating water for their daily consumption as well as for their cattle. With this short and small scale clean water and sanitation program, we are now able to provide clean water, at least, to Emmanuel clinic workers, to all Emmanuel clinic visitors and to these families who are residents of the nearby kebeles and villages of the community. Generally, the project will also minimize Emmanuel clinic’s water expenses. It will also improve access to potable water and sanitation for the community as well as for Emmanuel members, which in turn would minimize migration of Emmanuel clinic working staff and beneficiaries because of lack of clean water. This said, however, given the very high demand by the densely domiciled population of the town and the surrounding villages, it doesn’t mean that this project alone would sufficiently address the existing critical shortage of water in the area. It has been submitted by the coordinator of the project that we still have to construct as minimum as around 10 water excavation pipelines if the majority are to have access to the minimum amount of water. PBF remains positive and buoyant to contribute its part.